Hong Kong has an extensive network of public bus services covering almost all areas of Hong Kong Island, Kowloon, the New Territories and Lantau Island. The operation of bus services can be traced back to the 1920's when, in 1921, the Vehicles and Traffic Regulation Ordinance set out the fares, stopping points and bus specifications for four bus routes serving Kowloon. The first franchises were awarded in 1933 to China Motor Bus Company Limited and Kowloon Motor Bus Company (1933) Limited (KMB). The third franchised bus company was New Lantao Bus Company (1973) Ltd which has operated franchised services on Lantau Island since 1974. In 1991 Citybus Limited, which since 1979 had operated a shuttle service for dockyard workers with a single bus and later, some residential services, was granted a franchise for operating one Hong Kong Island bus route previously operated by CMB and acquired further routes from 1993 and 1995. 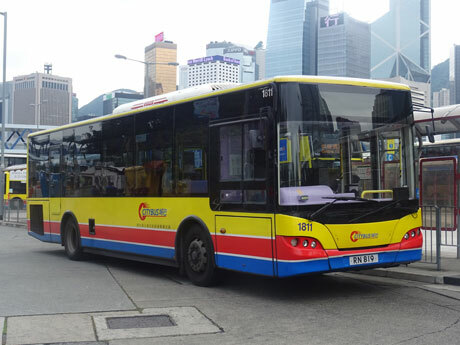 In 1998 CMB's history of operating franchised bus services came to an end* when New World First Bus Services Limited (NWFB), a new operator in Hong Kong, won the tender to operate 88 routes previously operated under CMB's franchise. In 1996, with the opening of the Lantau Link serving the new Hong Kong International Airport at Chek Lap Kok, Long Win Bus Company Limited, a subsidiary of Kowloon Motor Bus Holdings Limited, and Citybus were awarded the franchises to operate services for airport and North Lantau routes. * after losing its franchise CMB operated a private free shuttle bus service on six days a week between North Point Government Offices and Island Place at North Point from 1998 until ceasing operation on 30th June 2015. Currently Hong Kong's franchised bus network is made up of about 600 routes, operated under six franchises by five franchised bus companies with a total fleet of 5,982 franchised buses (at end of 2017), comprising 5,665 double-deck and 317 single-deck vehicles. Each day franchised buses make over 80,000 journeys with a patronage of about four million passengers. Under current legislation, franchised buses must be retired from service before reaching an age of 18 years. The Kowloon Motor Bus Company (KMB) was founded in 1921 and originally operated nine 16-seat Ford buses on routes between Tsim Sha Tsui, Sham Shui Po and Hung Hom. KMB later merged with Nam Hing Bus Company, Cheung Mei Bus Company and Chung Hing Motor Bus Company and subsequently bought Kai Tack Motor Bus Company to form The Kowloon Motor Bus Company (1933) Limited in 1933 and was awarded the 15 year franchise to operate bus services in Kowloon and the New Territories in the same year. The company is also the joint operator with Citybus and New World First Bus of some franchised cross-harbour routes and was also the first recorded operator of bus services on Lantau Island from 1960 until surrendering the franchise in 1965. After restructuring in 1997 Kowloon Motor Bus Holdings Limited was established and became the ultimate holding company of the KMB Group. As part of the restructuring the subsidiary company Long Win Bus Company Limited was established to operate franchised bus services between the New Territories and the new Hong Kong International Airport at Chek Lap Kok. KMB also operates a shuttle service between the New Territories town of Tin Shui Wai and the Lok Ma Chau Spur Line Control Point at the border with mainland China. In 2005 Kowloon Motor Bus Holdings Limited was renamed Transport International Holdings Limited. Commencing in July 2017 KMB began rolling out a new red and silver livery which also features an outline of Hong Kong skyscrapers and the slogan "Heartbeat of the City". 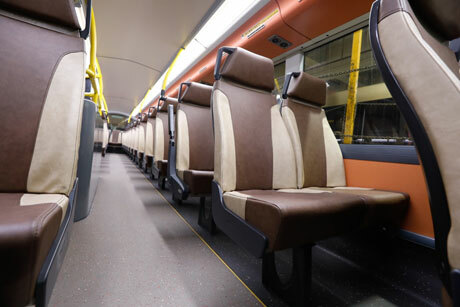 The livery has first appeared on a fleet of 70 new buses which are equipped with USB ports, free Wi-Fi and screens on the lower deck indicating the number of vacant seats upstairs. KMB has been granted a new ten year franchise which runs from 1st July 2017 until 1st July 2027. KMB daily passenger patronage is about 2.75 million. At the end of 2018 KMB operated a fleet of 3,973 double-deck buses and 148 single-deck buses. Long Win Bus Company Limited was formed as a subsidiary company of KMB Holdings Limited (now Transport International Holdings Limited) in 1998. KMB had been the preferred operator by the government when inviting tenders for franchised bus services between the new Hong Kong International Airport, North Lantau and the New Territories and Long Win was set up as a separate company to specifically to operate these services. Its services are branded "Airbus" and in addition to its "A" prefix limited stop services to and from the airport, it operates "E" prefix "external" route local services between the airport, Tung Chung and some New Territories towns and also jointly operates with Citybus, shuttle services between the airport and surrounding area including Tung Chung and AsiaWorld-expo and between the Lantau Link Toll Plaza and Hong Kong Disneyland. For further information about airport bus services see TO/FROM AIRPORT. Long Win bus services carry about 107,000 passengers daily. Long Win's current franchise runs until May 2023. At the end of 2018 Long Win operated a fleet of 258 double-deck buses and 4 single-deck buses. Citybus was established in 1979 as a small non-franchised bus operator with a single bus operating a shuttle service for workers of United Dockyards but later expanded into other private and contract hire services including a few residential coach routes. In 1991 the company broke the monopoly held since 1933 by China Motor Bus Company (CMB) for franchised services on Hong Kong Island when it was awarded the franchise to operate route 12A. Subsequently a further 28 routes previously operated by CMB were transferred to Citybus in 1993, followed by 14 in 1997 and 12 more in 1998. Citybus also bid for the remaining 88 CMB routes in 1998 after the government had decided not to offer the company a new franchise following continuing dissatisfaction with CMB but the tender was awarded to New World First Bus, which since 2004 has been part of the same group as Citybus. In 1996 Citybus won the tender to operate franchised bus services from 1998 between the new Hong Kong International Airport at Chek Lap Kok and urban districts of Hong Kong Island and Kowloon, which it operates under the "A" prefix premuim "Cityflyer" brand, as well as "E" prefix "external" local services between the airport, Tung Chung, Hong Kong Island and Kowloon. It also operates shuttle services between the New Territories town of Tuen Mun and the Shenzhen Bay Control Point at the mainland border as well as jointly operating with Long Win Bus Company, local shuttle services between the airport and surrounding area including Tung Chung and AsiaWorld-expo and between the Lantau Link Toll Plaza and Hong Kong Disneyland. In 2018 Citybus was awarded a franchise for a shuttle bus feeder service for the Hong Kong - Macau - Zhuhai Bridge operating between Sunny Bay Station and Hong Kong Port. For further information about airport bus services see TO/FROM AIRPORT. Citybus also jointly operates with Kowloon Motor Bus (KMB) some cross-harbour routes between Hong Kong Island and the New Territories. 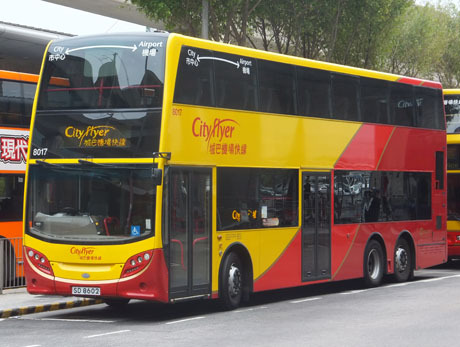 Citybus had been taken over in 1999 by UK based transport operator Stagecoach Group which subsequently, in 2003, sold its interest in Citybus to Delta Pearl Limited, a subsidiary of Chow Tai Fook Enterprises, the major shareholder in NWS Holdings. Chow Tai Fook and NWS Holdings formed a new company for its transport operations, Merryhill Group Limited in March 2004 and Citybus became part of that group, which was subsequently renamed NWS Transport Services Limited in December 2004. NWS Transport Services is also the parent company of Hong Kong bus operator New World First Bus (NWFB). The company's main franchise for services on Hong Kong Island and cross-harbour routes expires on 1st June 2016. In September 2015 the government granted Citybus a new 10-year franchise to commence 1st June 2016 on expiry of the current franchise and run until 1st June 2026. A new franchise for airport services was awarded in 2013 and expires in May 2023. Citybus daily patronage is about 495,000 passengers for its main franchise routes and about 84,000 for its airport routes, as at end of 2017. At the end of 2018 Citybus operated a fleet of 969 double-deck and 38 single-deck buses of which 233 double-deck buses were allocated to its airport franchise. New World First Bus Services (NWFB) was established in 1998 as a consortium led by Hong Kong conglomerate New World Enterprises and which included the large UK based transport operator FirstGroup. The company was established to bid for routes on Hong Kong Island operated by China Motor Bus (CMB) which had been put out to tender following increasing public and government dissatisfaction with its services. In March 1998 NFWB was awarded the franchise to operate 88 CMB routes with effect from 1st September 1998. On being awarded the franchise NWFB immediately placed orders for 243 new buses, subsequently increased to 500. It was, however, possible to source only 62 new vehicles for the beginning of services and in August 1998 NWFB purchased 710 buses from CMB. In April 2000 FirstGroup withdrew from the consortium and sold its interest to NWS Holdings but NWFB kept its original trading name and continued to follow the development plans which it had agreed whilst in partnership with FirstGroup. In March 2004 NWFB became a member of Merryhill Group Limited, a new company established jointly by NWS Holdings and Chow Tai Fook Enterprises Limited which was renamed NWS Transport Services Limited in December 2004. NFWB services operate mainly on Hong Kong Island but also operates some routes wholly within the eastern New Territories and jointly operates some cross-harbour routes to Kowloon and the New Territories with KMB. NWFB's current franchise took effect in 2013 and expires in July 2023. NWFB services carry about 447,000 passengers daily, as at end of 2017. At the end of 2018 NWFB operated a fleet of 691 double-deck and 17 single-deck buses. New Lantao Bus Company (1973) Limited (NLB) was formed by amalgamation of existing Lantau Island bus operators United Lantao Bus Company, Ngong Ping Bus Company, Tai O Public Bus Company and Tai Long Wan Village Bus. United Lantao Bus had previously taken over two similarly named operators, Lantau Bus Co and Lantau Motor Bus Co. in 1967 and 1969 respectively. NLB commenced operating services under licence from 1973 until being awarded the exclusive franchise for operation of bus services on Lantau Island in 1974. Kowloon Motor Bus (KMB) had been the first operator of bus services on the island from 1960 until surrendering its franchise in 1965. Several local operators subsequently began services but quality of service declined and a serious accident led to the government demanding improvements to the organisation and financial operation of the bus companies which resulted in the formation of NLB. The company inherited 41 vehicles and four routes from the constituent companies. In 1992 NLB was aquired by Kwoon Chung Motors, a major operator of contract and private hire services in Hong Kong. In 1998 NLB was authorised to operate a special airport service A35 between the new Hong Kong International Airport and South Lantau and extended its services into the new estates of the airport town of Tung Chung. The company also operates a shuttle service between Yuen Long in the New Territories and Shenzhen Bay Border Control Point. 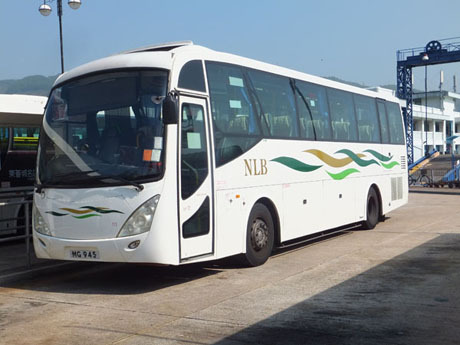 In 2018 NLB was awarded franchises for two feeder shuttle bus services for the Hong Kong - Macau - Zhuhai Bridge operating between Hong Kong International Airport / Asia World-Expo and Tung Chung and Hong Kong Port. In September 2015 the Government awarded the company a new 10-year franchise to commence on 1st March 2017 and run until 1st March 2027. NLB's daily passenger patronage, as at end of 2017, is about 78,000. At the end of 2018 NLB operated a fleet of 102 single-deck and 53 double-deck buses. In addition to services operated by the franchised bus operators, Hong Kong's rail operator, MTR operates 13 licensed bus routes in the northwest New Territories serving MTR West Rail Line and MTR Light Rail stations in the towns of Tuen Mun, Tin Shui Wai and Yuen Long and 4 local feeder bus routes serving Tai Po Market Station on MTR East Rail Line (operated by KMB on behalf of MTR) in the northeast New Territories. When transferring directly between MTR or Light Rail and MTR bus, the bus connection is free when using Octopus Card, subject to the connection being made within 60 minutes. These services were previously operated by Kowloon-Canton Railway Corporation (KCRC) prior to its merger with MTR Corporation in 2007. KCRC had established its bus division in 1986 to provide feeder bus service within Tuen Mun and Yuen Long following construction of Light Rail network. KCRC Bus Division also acquired two free feeder services operated by KMB. 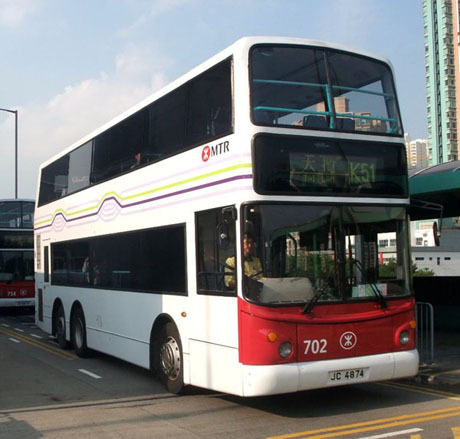 KCRC and MTR merged in December 2007 and KCRC Bus Division was renamed MTR Bus Division. The number of feeder bus routes has declined in recent years since the Public Transport Intermodal Coordination Policy (PTICP) introduced by the government in 1986 was relaxed. Under the PTICP rail was to become the heart of the public transport network and residents of the New Territories were encouraged to use rail by placing restrictions on the final stop of bus services from the New Territories to urban areas. MTR Bus had a fleet of 144 buses (133 double-deck and 11 single-deck), as at end 2018, which carry about 139,000 passengers daily. During 2016/2017 MTR is introducing a new fleet of 68 11.3-metre long buses fitted with Euro V engines to replace existing buses which are being retired. As at January 2017 there were 1,095 buses licensed to provide Residents' Services on behalf of the owners, residents or management of residential developments. Residents' Services are a type of non-franchised public bus service, available to all, and include those operating in Discovery Bay and Ma Wan. Discovery Bay Transit Services purchased six double-deck buses for use on its external route to Sunny Bay MTR Station from August 2015. It has since introduced double-deck buses to its Tung Chung route. 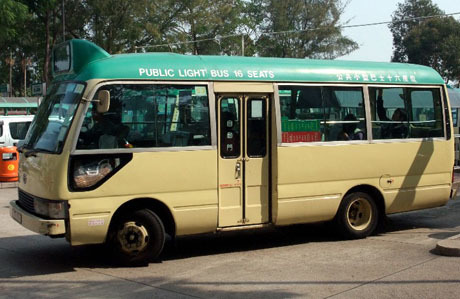 Over 4,300 16, 17 and 19-seat minibuses (Public Light Bus) also provide frequent services mainly in areas where high-capacity vehicles would not be viable, although some routes do partially or wholly duplicate franchised bus routes and often provide useful “feeder services” to MTR stations and transport interchanges. Further information about Public Light Bus services are detailed under a separate section PUBLIC LIGHT BUS (Green Minibus and Red Minibus). Fares are paid on entry by either Octopus Card or cash and are based on a flat fare regardless of distance of travel. The Octopus Card reader and cash fare box are located next to the driver. Tickets are not issued except for “A”- prefix airport routes, where pre-paid tickets are available as an additional option to Octopus Card or cash payment. Fares are calculated in fare stages and usually reduce as each stage along the route is reached although on shorter routes the same flat fare may apply along the whole route. Octopus Card is swiped only on entry to the bus, except on a small number of routes, for example, between Central and Stanley, where sectional fares are available, in which case Octopus Card should also be swiped on exit for the card to be credited with the difference between the full fare charged on entry and the sectional fare. If paying bus fares in cash (coins or notes) no change is given so the exact fare should be paid as any overpayment will not be refunded. Travel on buses is now almost cashless with the vast majority of passengers using Octopus Card for payment. Standing is allowed on the lower deck only and is common on some routes during peak hours. All buses are fitted with bells for passengers to indicate they wish to disembark at the next stop and most buses (except those of New Lantao Bus Company) are fitted with visual and audible announcement systems indicating the name of the next stop in both English and Chinese. Many buses are also fitted with TV screens for entertainment and advertising. Eating, drinking and smoking on buses is not allowed. Since November 2008 free Wi-Fi internet access has been made available on buses on some routes operated by Citybus, including all "Cityflyer" airport routes and New World First Bus and by the end of 2014, about 300 buses were wi-fi enabled. For more information on routes with Wi-Fi access see INTERNET ACCESS. Services to most areas are frequent and operate from early morning to around midnight. Night services also operate to many districts and the airport. Many routes pass through the cross-harbour routes linking Hong Kong Island with Kowloon and cross-harbour route numbers are prefixed to identify which tunnel they use. Prefix "1" indicates Cross Harbour Tunnel, "6" Eastern Harbour Crossing, "9" Western Harbour Crossing. Night services to many areas which are prefixed "N", recreational services (usually special Sunday and public holiday services) prefixed "R" and shuttle (usually frequent circular) services prefixed "S". Residents' Services are prefixed "NR", "HR", "KR" or "DB" (Discovery Bay) although some "NR" services are often referred to under the old numbering system which instead carried a suffix of "R"
Full details of routes, frequencies and fares can be obtained by using search engines on the bus operators websites for which links are provided under the "Current Franchised Bus Operators" section above. Users of mobile devices can download KMB and Citybus/NWFB apps with route planning and fare information. All bus companies have websites (links can be found in information above for current franchised bus operators) which have details of routes, fares and timetables. The websites and apps of KMB/Long Win and Citybus/New World First Bus also have interactive point to point journey planners. KMB was, in March 2011, the first bus company in Hong Kong to launch an iPhone app providing comprehensive information on KMB and its sister company Long Win Bus Company's services. The app offers four functions, “Point to Point Search”, “Route Number Search”, “Nearby Bus Stop” and “Alight Reminder”. The first three functions provide users with different ways to search for a bus route, offering detailed routings, route maps, timetables and route announcements, as well as photos of every bus stop. In the “Point to Point Search”, when several routes serve the same destination the system displays the lowest fare option as well as the route with the fewest en-route stops, allowing users to make their own choice according to their needs. The “Nearby Bus Stop” function, making use of the iPhone’s Global Positioning System, automatically identifies the location of the user and list all bus routes available and the location of their corresponding bus-stops within 200 metres. The KMB iPhone App is available in traditional Chinese, simplified Chinese and an English version. The English version can be selected from the iPhone settings menu. iPhone and iPod Touch users can download the App free of charge from the iTunes App Store. The app has since been made available on other mobile platforms. In October 2011 Citybus and New World First Bus launched a similar App for iPhone and Android devices. Additionally, Hong Kong eTransport Kiosks have been installed at several locations, including the Arrival Hall of Hong Kong International Airport, Hong Kong Convention and Exhibition Centre, Tsim Sha Tsui Star Ferry Pier, MTR Sha Tin Station and Tuen Mun Road Bus-Bus Interchange, for use of tourists and other members of the public who may not be able to readily access the internet. 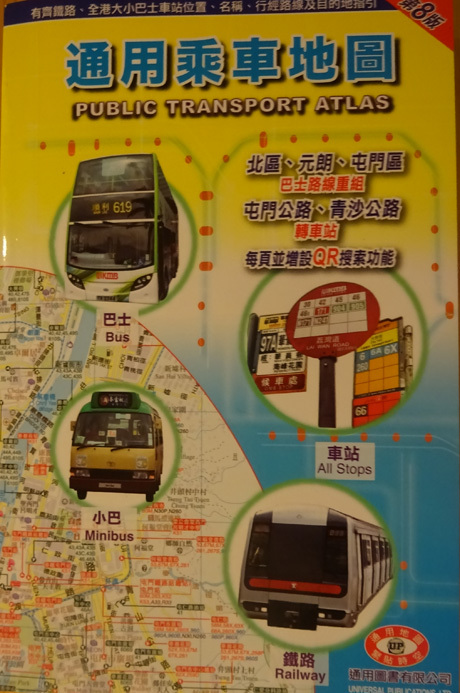 Universal Publications publishes a "Public Transport Atlas" (HK$69) containing comprehensive street and area maps with names in English and Chinese showing bus routes by number and boarding points. The atlas also shows all green minibus stops. The index of routes, however, is only in Chinese. The atlas be obtained from booksellers throughout Hong Kong. Citybus/New World First Bus publish a free leaflet "Hong Kong Bus Travel Guide" in English detailing airport routes and hotels served and several scenic routes. This can be obtained from Citybus/New World First Bus Customer Service Kiosks at the Airport bus terminus and Admiralty (East) bus station or downloaded from the Citybus/NWFB website. Since 2001 all franchised bus companies, except New Lantao Bus Company, have agreed that all new buses will be wheelchair accessible and at the end of March 2013 there were 3855 wheelchair accessible low-floor buses. All franchised buses are expected to be low-floor by 2017 with the exception of some buses operated by New Lantao Bus Company along routes on Lantau Island which have topographical constraints such as steep gradients and sharp bends which are unsuitable for wheelchair accessible buses. Double-deck buses were first introduced into Hong Kong in 1949 and most of the current fleet are 12-metres length but on some difficult routes shorter double-deckers of 10 or 11-metre length are used. In recent years the fleet has been upgraded to meet European emission standards. Kowloon Motor Bus (KMB) with a fleet of 3725 has retired all 288 of its Euro 1 buses and replaced with Euro IV and V models. New World First Bus and sister company Citybus had replaced all their 440 pre-Euro and Euro I buses by the end of 2012. In December 2012, KMB ordered 370 brand new E500 Euro V air conditioned double-deck buses from British manufacturer Alexander Dennis Limited. The buses, which KMB co-developed with the manufacturer, are expected to produce fuel savings and a reduction of 10% in carbon emissions by reducing body weight and utilising a more efficient air conditioning system and its chassis will be compatible with the future Euro V1 engine. Passenger capacity of the new buses is 136 (90 seated and 46 standing). 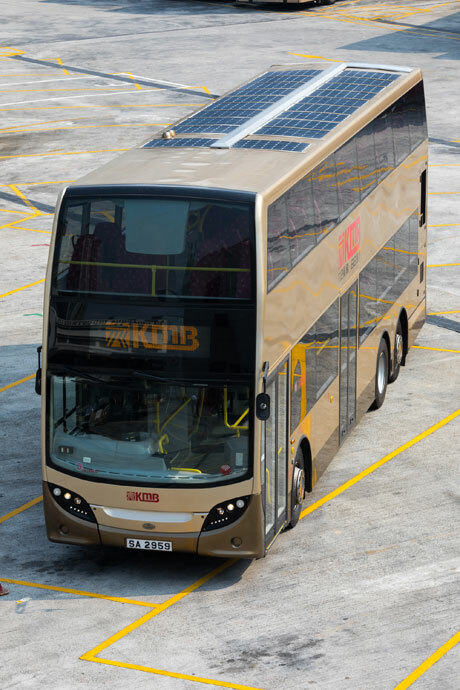 The order is part of KMB's 5-year purchasing plan which will see 1800 older buses replaced and the new buses, which were in service by mid-2013, are used on routes connecting urban areas with new towns in the New Territories. The number of buses and routes has declined slightly since 2003 under the Transport Department's Bus Service Rationalisation Plan to enhance the efficiency of the bus network by avoiding unnecessary overlapping of routes and reducing frequencies to take into account passengers increased choice of transport with the opening of new railway lines as well as reducing congestion and pollution. Part of the route rationalisation process is the introduction of Bus-Bus Interchange hubs (BBI's), the first of which was Tuen Mun Road Bus-Bus Interchange which opened in December 2012. All buses are air-conditioned, since KMB phased out its few remaining air-conditioned buses in May 2012. Double-deck buses were first introduced into Hong Kong in 1949 and most of the current fleet are 12-metres length but on some difficult routes shorter double-deckers of 10 or 11-metre length are used. In recent years the fleet has been upgraded to meet European emission standards. Kowloon Motor Bus (KMB) with a fleet of 3725 has retired all 288 of its Euro 1 buses and replaced with Euro IV and V models. New World First Bus and sister company Citybus had replaced all their 440 pre-Euro and Euro I buses by the end of 2012. In December 2012, KMB ordered 370 brand new E500 Euro V air conditioned double-deck buses from British manufacturer Alexander Dennis Limited. The buses, which KMB co-developed with the manufacturer, are expected to produce fuel savings and a reduction of 10% in carbon emissions by reducing body weight and utilising a more efficient air conditioning system and its chassis will be compatible with the future Euro V1 engine. Passenger capacity of the new buses is 136 (90 seated and 46 standing). 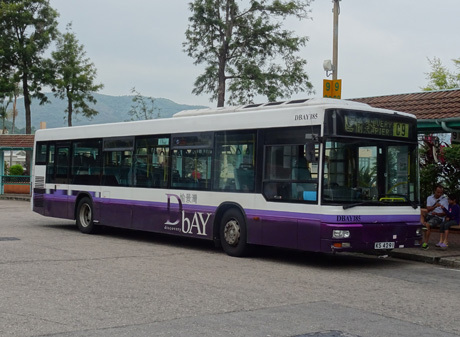 The order is part of KMB's 5-year purchasing plan which will see 1800 older buses replaced and the new buses, which were in service by mid-2013, are used on routes connecting urban areas with new towns in the New Territories. In order to increase non-fare box revenue bus operators have equipped many bus shelters with electricity supply to display illuminated advertisements and provide power for vending machines. 1,477 bus shelters had been provided with electricity supply by the end of 2014 and 28 vending machines had been installed. During March 2012 KMB submitted proposals to the Transport Department to operate an electric bus route in east Kowloon. New circular route 5M would operate between Ping Shek Bus Terminus and Eastern Road at Kai Tak using single-deck buses developed by Youngman, a coach maker in Zhejiang province, in co-operation with German bus manufacturer Neoplan. The buses have a range of up to 10 kilometres after being fully charged and can maintain a continuous supply of air conditioning for up to an hour. There would be two charging stations at bus stops, using super-capacitor technology, which allow the zero-emission bus to get electricity from hanging wires through a pantograph extended from its roof. It had been expected, subject to approval, that the service would commence operating from mid-2013 but no further developments appear to have materialised. The range more than doubles the design range of the gBus, made by a joint venture of Volvo and Shanghai Automotive Industry Corporation, which was tested in 2011 and was found to have an actual range of only about 3.5 kilometres with the air conditioning running. KMB is also proposing to invest about HK$300 million on an electric bus network at Kai Tak before the completion of a HK$12 billion monorail in 2023 in the Kowloon East redevelopment project. In September 2012 KMB took delivery of its first fully battery-powered single-decker, known as the eBus, jointly developed by KMB and mainland manufacturer BYD. Based at Lai Chi Kok Depot, the gold-painted eBus is expected to be tested in areas of high roadside pollution such as Nathan Road. A rival electric bus manufacturer, Great Dragon, confirmed it was supplying a right-hand drive bus to a Hong Kong utility company in October 2012 for trials. A government-funded trial of electric buses began in 2013 and approval has been given for procurement of 36 buses and charging facilities to be trialled by KMB, Citybus/New World First Bus, Long Win Bus and New Lantao Bus. . Since 2010 KMB has also been conducting trials of an electric "gBus" (green and genesis) with zero emissions, leased from a Shanghai company. The single-deck bus which is 12 metres long and can carry up to 70 passengers operates on a super-capacitor system which allows the bus to travel 1km on a 30-second charge. Although trials operated satisfactorily, KMB is testing other prototypes with a longer range as well as testing battery-driven buses and hybrids. BYD, backed by US investment guru Warren Buffet, and Great Dragon - a joint venture between mainland bus maker Yixing and Global Electric Vehicles, owned by Hong Kong-listed Dah Chong Hong announced is piloting a new breed of electric bus at its Changsha factory, designed with Hong Kong road conditions in mind. 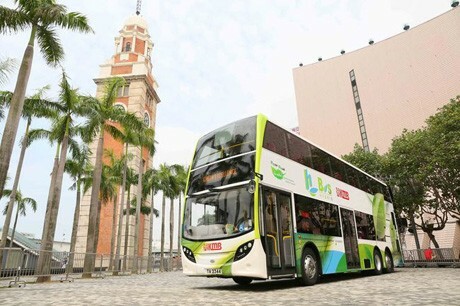 It is building 16 single-decker electric buses for testing in Hong Kong by organisations awarded subsidies under the government's Green Transport Fund and in November 2013 KMB began a one-month trial of a BYD electric single-decker on route 2, which plies between Star Ferry Pier at Tsim Sha Tsui and So Uk, a distance of 7km. 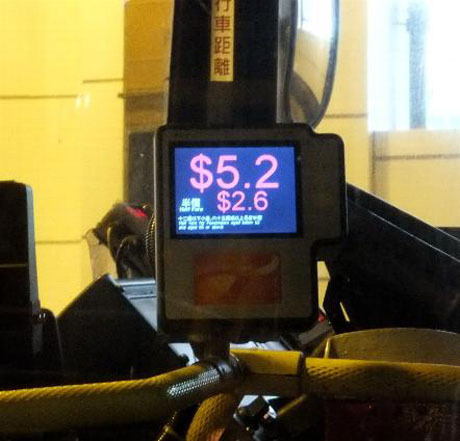 The bus is charged each night at Lai Chi Kok depot and three hours charging is sufficient for 180km travel. The bus can accommodate 66 passengers (31 seated and 35 standing). In March 2013 Citybus announced that it was replacing the whole of its 15/16 year old "Cityflyer" airport bus fleet over a two-year period commencing April 2013. 66 new Alexander Dennis Enviro500 Euro5 buses feature reclining high-back leather seats, individual reading lights above upper deck seats and larger luggage racks as well as enhanced environmental performance. 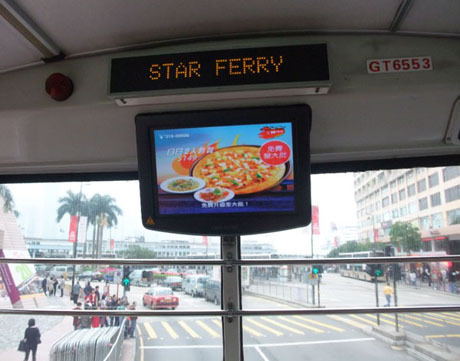 Multi-functional LCD panels display the names of the next three bus stops and hotel names, all buses are equipped with free wi-fi and luggage rack areas are monitored by CCTV. The fleet has been replaced two years ahead of the normal fleet replacement schedule. In June 2014 the Transport Department approved a fare increase averaging 3.9% on KMB services with effect from 6th July 2014 after over 70% of KMB's routes were loss making. 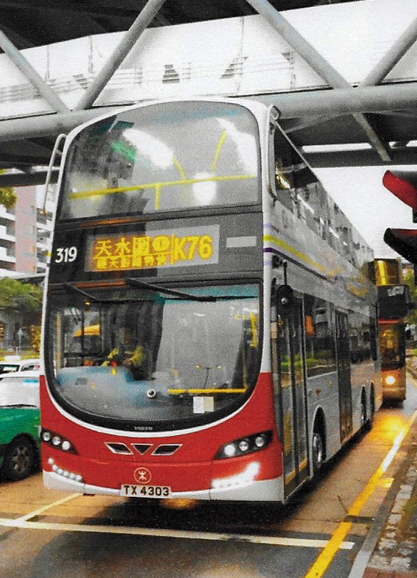 The longest buses in Asia began operating in Hong Kong in June 2014 when KMB began testing protoypes of two models of 12.8 metre double deck buses with a passenger capacity of 146, 8 more than any bus in the existing fleet. The buses can cater for 98 seated passengers (35 on the lower deck, 63 on the upper deck) as well as 48 standing passengers. The models are Alexander Dennis Enviro500 Turbo and Volvo B9TL. Components were made in the UK and assembled in Zhuhai. KMB placed orders for four prototypes, two from each manufacturer, each costing over HK$3 million. Testing was expected to last for about three months with the buses operating on four routes with heavy demand in the New Territories, 43X and 49X Sha Tin to Tsuen Wan, 277X Fanling to Lam Tin and 279X Fanling to Tsing Yi. New World First Bus and Citybus took delivery of three Government subsidised 12-metre Enviro 500 Hybrid Double Decker buses from UK manufacturer Alexander Dennis in mid-September 2014.The buses are equipped with a small diesel engine which powers the on board generator which provides electricity for the drive motor, air conditioning and other facilities and charges the internal Lithium Ion-batteries. The latest intelligent "Arrive and Go" technology allows the bus to shut the diesel engine down when approaching a bus stop at speeds of less than 6.4km per hour and switch to electrical mode. The diesel engine restarts when the speed rises above 11.2km per hour. Following their introduction into service the buses are subject to comprehensive testing by the companies and the Environmental Protection Department for performance, fuel performance and emission efficiency. 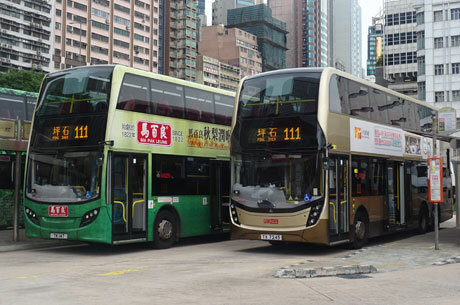 In November 2014 KMB introduced Hong Kong's first Euro VI Hybrid Double-Deck hBuses for a 24-month trial of passenger services on three routes, 1A Star Ferry - Sau Mau Ping, 619 Shun Lee - Macau Ferry (Central) and 104 Pak Tin - Kennedy Town. The hybrid buses are the first double-deck buses equipped with a Euro VI engines, and the first double-deck buses with the air-conditioning system powered by electricity. It is expected that hBus will achieve fuel savings of up to 30%, while emissions of major pollutants will be reduced considerably (e.g. particulate matter by 50% and NOx by 80%), when compared to Euro V double-deck buses. hBus is equipped with a “hybrid series” driveline system and a generator driven by a diesel engine that supplies electricity to drive an electric motor which powers the axles. The regenerative braking system captures the otherwise wasted braking energy and stores it in the batteries, making the bus even more environmentally efficient. In early 2016 it was disclosed by the Environmental Health Department that the hybrid double-deckers have not been as efficient as expected owing to heavy use of air conditioning systems during the summer which has led to overall higher fuel consumption than conventional buses. Under the 2015/2016 Bus Route Development Programme the Transport Department and bus operators are proposing to enhance services of the bus network serving the airport. It is planned to introduce two new Long Win Airbus "A" routes serving Yuen Long and Tai Po as well as a new supplementary service to route A33. In addition it is proposed to increase the service frequency or operating hours of four "E" external airport routes and the S56 circular route between the airport and Tung Chung Station. In July 2015 New World First Bus and Citybus took delivery of the first of five government funded BYD zero-emission battery powered model K9R single-deck buses. The 11.6 metre buses have a range of 250km after a full four hour charge and can carry 31 seated and 35 standing passengers. Following a period of testing the first of these buses entered service on 27th December 2015 for a two year trial on Citybus route 11 (Central Ferry Piers to Jardine's Lookout Circular) with the other four buses following on 28th December 2015 on Citybus route 12 (Central Ferry Piers to Robinson Road Circular) and New World First Bus route 81 (Lai Tak Tsuen to Chai Wan Circular), 29th December 2015 on Citybus route 25A (Hong Kong Convention and Exhibition Centre Extension to Braemar Hill Circular) and 5th January 2016 (tentative) on New World First Bus route 78 (Wong Chuk Hang to Wah Kwai Estate Circular). Later in 2016 a five further battery operated buses are expected to enter trial service on Citybus/New World First Bus routes and 26 battery operated buses will begin trials on other operators routes. To monitor the trial of electric buses, the Government is setting up a task force, comprising representatives from franchised bus companies, the Environmental Protection Department and the Transport Department, and local experts. If the trial results are satisfactory, the Government will encourage franchised bus companies to use electric buses on a larger scale, taking into account affordability for the franchised bus companies and passengers. These buses were taken out of service on 8th December 2015 after it was found that the bus could open if the door seal was strongly pressed from the inside. Following inspection by the bus manufacturer and implementation of a control software upgrade the buses returned to service on 11th January 2016. 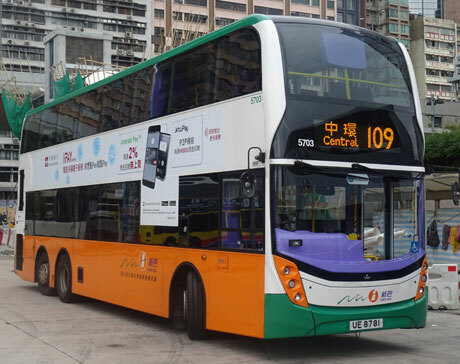 NWFB and Citybus planned to introduce its second batch of five Government-funded battery operated buses into service on routes 11 (Central Piers - Jardine's Lookout),12 (Central Piers to Robinson Road),25A (HKCEC - Braemar Hill), 78 (Wong Chuk Hang to Wah Kwai Estate) and 81 (Lai Tak Tsuen to Chai Wan) on 12th September 2016. However, their introduction has been deferred as a result of a problem with the door bell alarm which is awaiting rectification by the manufacturer. The buses have a passenger capacity of 35 seated and 29 standing and performance of the vehicles will be assessed over a two year period. Further problems occurred in mid-September when the first batch of five BYD buses, operating on routes 11, 12, 25A, 78 and 81, was taken out of service owing to problems with tyre slippage in wet weather. The braking system has since been improved by the manufacturers but the buses will not return to service until thorough checks have been carried out. The first locally designed electric bus had been due to begin operating one month of test runs on Hong Kong's roads in November 2015. The 12.5 tonne single-deck bus was designed by Hong Kong Productivity Council and Hong Kong Automotive Parts and Accessory System's Research and Development Centre in partnership with Green Dynamic Electric Vehicle Limited. The bus was built in mainland China and underwent nine months of trials in Chongqing and Dongguan before being delivered to Hong Kong. The 11.75-metre vehicle has a passenger capacity of 75 (35 seated and 40 standing) and can travel at up to 70km/ph. A four hour battery charge enabled the bus to travel up to 380km. The body was made of lightweight aluminium alloy, weighing 10 per cent less than existing electric buses, and has a gear-free permanent magnet synchronous motor and lithium polymer battery. The HK$40 million project began in August 2013 and was funded by the government's Innovation and Technology Fund. However, the prototype bus was destroyed by fire resulting from a short circuit and overheated battery on 13th December 2015. The cause of the fire was seepage of water into battery casings which led to short-circuiting and it is believed the battery casings had been damaged during performance tuning and inspection by Green's technical support staff in Dongguan. In August 2017 Citybus and New World First Bus submitted applications to the government for fare increases averaging 12% which would see fares for most Hong Kong Island routes increase by about HK$1 per trip and cross-harbour routes by about HK$2 per trip. Both operators have not increased fares since 2008 and have suffered a decline in patronage since the opening of the MTR Island Line extension to Kennedy Town in 2015 and the South Island Line in 2016 in addition to incurring substantial fleet replacement costs and a decline in advertising revenue. If approved, the increases would be expected to be implemented in January 2018. In September 2017 KMB began trials of a solar powered air conditioning system on one of its double-deck buses. 20 solar panels have been installed on the roof of the bus which provide a supplementary power source for the air conditioning system and can also supply power to on board USB ports. The trial bus is operating on Tuen Mun routes and KMB is planning to gradually add panels to other double-deck buses in its fleet. Following a fatal accident in February 2018 involving a double-decker bus, a Working Group comprising members of all franchised bus operators and major bus manufacturers was set up to further enhance bus safety. Following the Working Group's recommendations all new double-decker buses procured by franchised bus operators from July 2018 will have an Electronic Stability Control System and Speed Limiting Retarders and all passengers seats in all new buses ordered from July 2018 will have seat belts fitted. KMB announced in early 2019 that it is to internally refurbish its "mid-life" (about 8 years old) buses with paint respray, new seats and a fresh new look to bring to enhance the comfort level of the buses to the same standard as the new generation "Red Bus". The project is expected to begin in June 2019 with about 270 buses being refurbished in the first batch. In January 2019 the government approved fare increases averaging 7% and 5.5% for routes operated by Citybus (franchise for Hong Kong Island and Cross-Harbour Network) and NWFB respectively. The revised fares take effect on 20th January 2019. These are the first fare increases since 2008 and have been mitigated by the governments Franchised Bus Toll Exemption Funds which were introduced in the Chief Executive's 2018 Policy Address. Had it not been for the exemption the fare increases would have amounted to 9%.